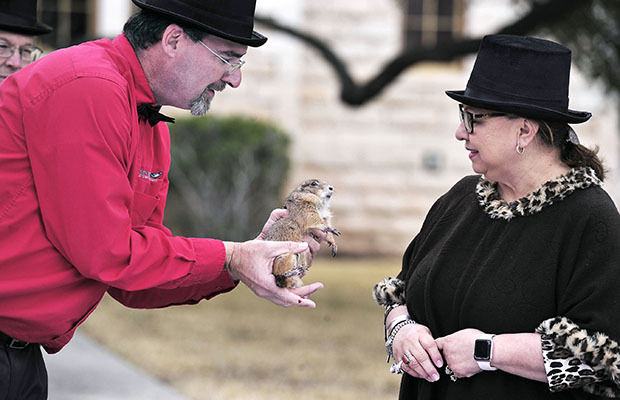 A small crowd gathered on the lawn of the Sutton County Courthouse Saturday morning eagerly awaiting the annual Groundhog Day West Texas Style prediction of soon to be spring or six more weeks of winter during the annual February 2 celebration. Not so eager to be awakened by the tap, tap, tap of a magic stick, by Judge Steve Smith, Dazzle, the weather prognosticating black tailed Prairie dog, sank her teeth into Michael Price Executive Director, Eaton Hill Nature Center and Preserve before telling Betty Hernandez, Interim City Manager, she did not see her shadow. According to lore, this means spring is on its way. Her famous Groundhog Cousin Punxsutawney Phil also didn’t see his shadow, predicting winter’s end soon for folks north of West Texas. But just in case, don’t go packing away your winter clothes yet. The projection of spring is not absolute. According to The National Oceanic and Atmospheric Administration the rodent’s prediction is only correct about 40 percent of the time. The roots of the Groundhog Day tradition in the United States date back to the 1800s. 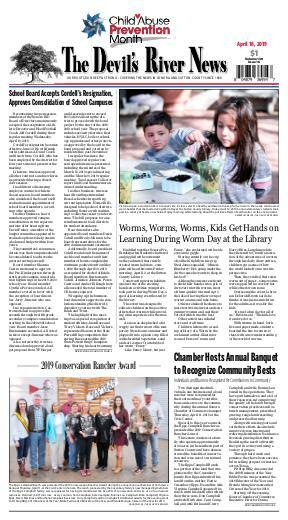 Groundhog Day may be mentioned in other traditions and folklore, but the present day phenomenon of Punxsutawney Phil’s Groundhog Day is the creation of a well known influence - the newspaper. The pomp and pageantry of Groundhog Day was actually created by a local newspaper editor in Punxsutawney in the 1880s. The then superstition that groundhogs could predict the weather was already known in Pennsylvania and reports on whether groundhogs saw their shadow was printed in local newspapers. However, the tradition of the Pennsylvania weather forecasting rodent known as Punxsutawney Phil was not just for his small-town namesake – it was for the entire country thanks to the tireless promotion by a small-town newspaper editor in the 1880s. The Punxsutawney spirit and the local Groundhog Club designated Phil as the one true weather-predicting groundhog. Today, curiosity seekers north, south, east and west still gather every February 2, in wait of the traditional foretelling in hopes of hearing that spring is just around the corner.